We’ve had a busy few weeks at fivethirty home so you know what that means…lots of great new furniture pieces have arrived! We are especially smitten with this sweet little bench – the linen fabric, the caned sides, the miss mustard seed’s grain sack finish. Sofa tables and side tables, rolling tables, plant stands and garden stools have arrived this week. Come in soon to see what’s new! Are you ready to start planting? Do you grow herbs, veggies or pretty flowers?? We’ve got you covered!! We brought in lots and lots of pots! And planters, baskets, birdhouses, herb and veggie markers and anything else you may need to get the growing going…stop in soon to pick up some pretty pieces for your garden. Well, this is certainly and improvement, if we do say so ourselves. A couple of coats in Miss Mustard Seed’s Milk Paint Linen and some French script fabric turned this vanity stool from outdated to oooooh la la!! 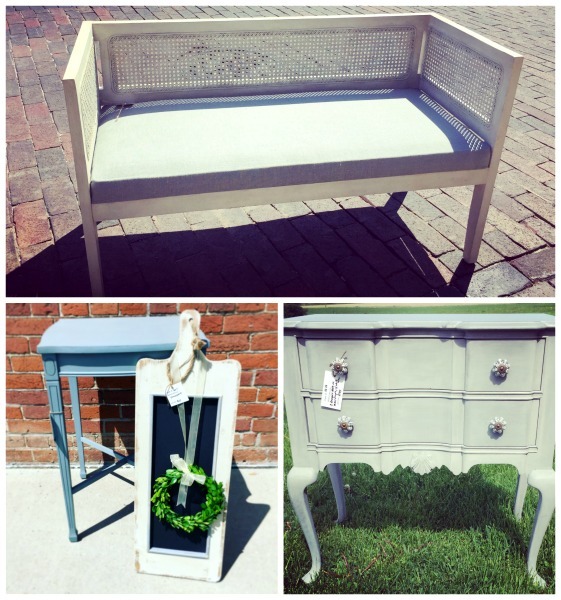 Both of these pieces in Mustard Seed Yellow are finished with a light coat of Miss Mustard Seed’s Milk Paint Antiquing Wax…. Artissimo is the navy in the Miss Mustard Seed’s Milk Paint line. We use it all the time because: 1. I love it, and 2. I have navy in my own home and may need to borrow whatever we are painting to go home with me! We love the product of the month for April, tough coat! Tough coat can be used as matte sealer on milk paint or as a clear primer to block any bleed through before painting with Miss Mustard Seed’s Milk Paint or any porous paint. Here we are using tough coat on the top of a mahogany desk that had been sanded. Since we wanted to use a lighter color, tough coat will help block the potential bleed through! Read all about how Miss Mustard Seed used it to seal her dining room table. Happy Spring Break to everyone! We are checking out this month’s Colors of the Month and feeling some serious spring vibes! !